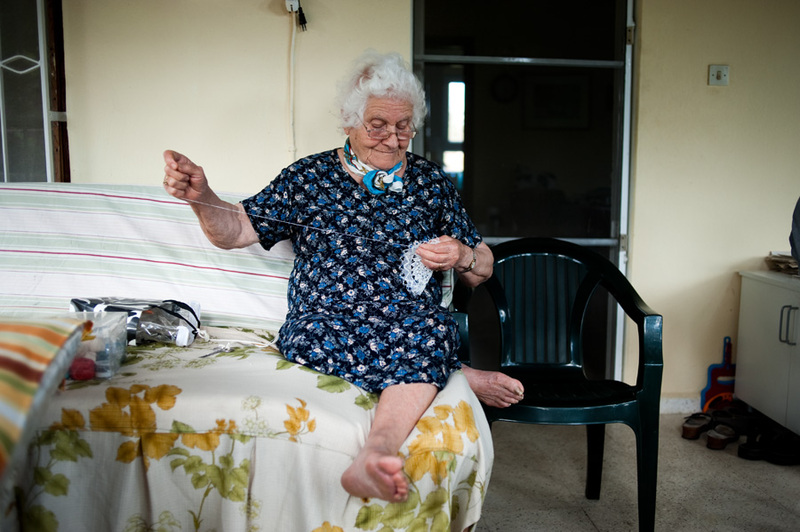 Sara Demirci, sitting on her porch divan, works on her tatting. 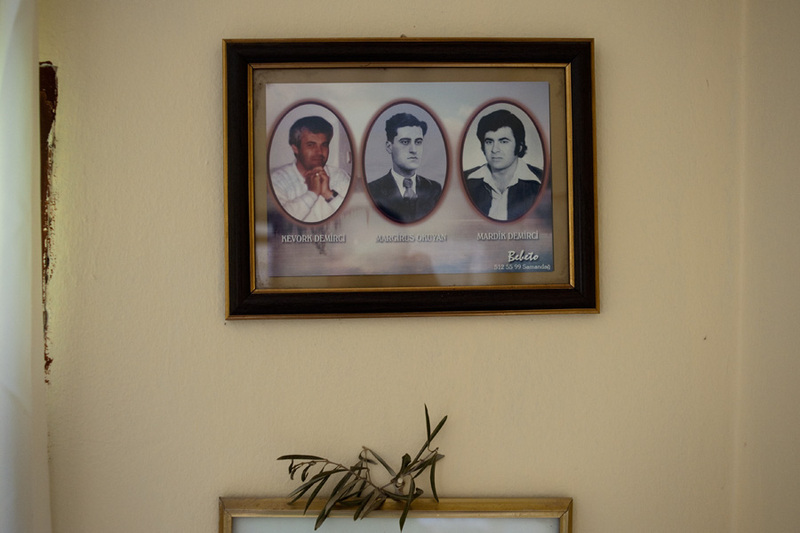 Portraits of Sara’s deceased brother Margirus Okuyan (middle) and two deceased sons. Her sons, Kevork and Mardik, both died young of heart failure. 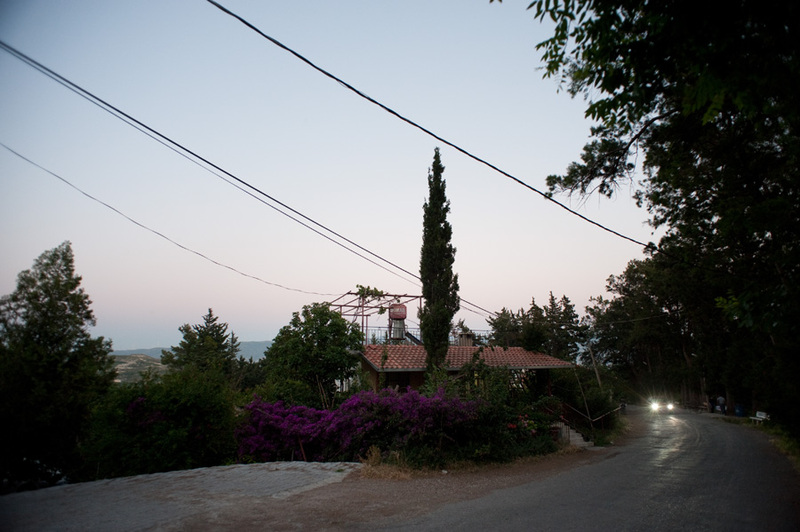 The house Sara lives in with her husband, Avedis, is surrounded by bougainvillea flowers. 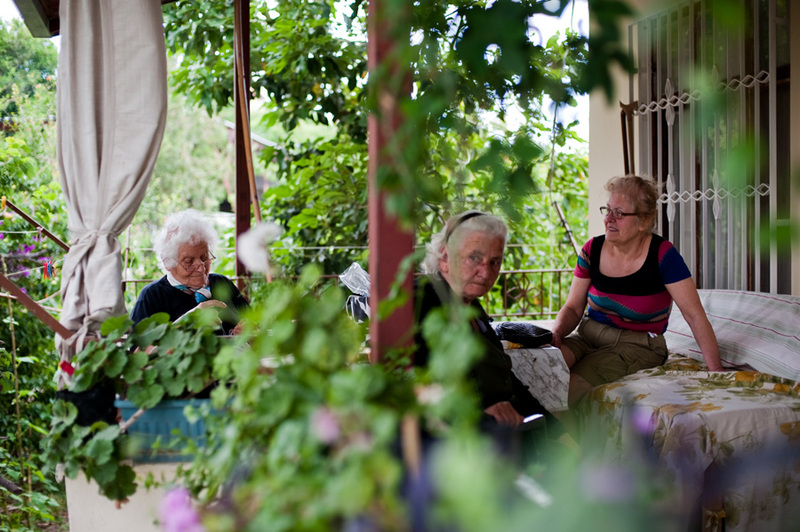 Sara visits with her daughter, Vartuhi (right), and her neighborhood friend, also named Vartuhi (middle). “Vartuhi” means “rose” in Armenian. While her husband, Avedis, tells stories from the hospital bed tucked against a wall in the living room, Sara Demirci’s attention is on one thing: the television. “Fatmagül’ün Suçu Ne,” a Turkish soap opera, fills the small area with vibrancy and youth. The volume is loud to accommodate her poor hearing. When one character embraces another on the show, Sara’s strong features settle into a pleasant smile. At 86, Sara looks younger than her years. Her face is relatively unlined, her brown eyes bright, her hands strong and capable. She takes care of her husband, who, at 99 years old, is the oldest man in the village. Sara’s only daughter, Vartuhi, a lively blonde in her sixties, and her husband, Canik, come to Vakıflı for a few weeks every summer to help out, but most of the responsibility falls on Sara’s shoulders. She handles it well. At the end of tea – and the end of her soap opera – Sara pushes herself off the newspaper- and blanket-lined couch to gather various glass cups and tin saucers on the coffee table. She shuffles into the kitchen to wash them and shuffles back out to resume her spot on the couch. Although her life seems routine, her days filled with watching over her husband and her house, she seems happy with her life. She and Avedis have been married for 70 years and have four children together, though two of their sons passed away several years ago. When asked when she fell in love with her husband, Sara’s face breaks into a grin, surprise flushing her features. “How could we fall in love? We didn’t even see each other before [the wedding]!” she says incredulously. In 1942, and even through the 1950s, it was not appropriate for couples to speak to each other in public, Sara’s son-in-law, Canik, explains. Even when Canik and Vartuhi, his wife, were saying good-bye to each other before he left for his mandatory military service, people were appalled that the two would hold hands in public. Still, with a lifetime of growing affection between them, Sara and Avedis are together, in love, for whatever amount of days they have left. Despite his wife’s dismissal of her ability to fall in love with him, Avedis points out that he eventually won her over through poetry. And poetry is the best way to describe their decades-long relationship. 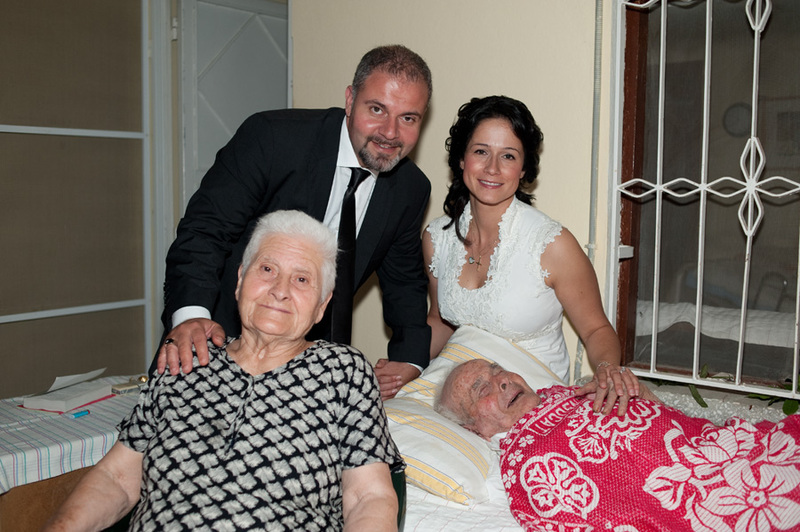 Sara poses with her husband, Avedis, her grandson, Arman, and his wife, Janine, on their wedding day. As a gesture to their grandparents, Arman and Janine traveled all the way from Canada to have a wedding ceremony in Vakıflı.